One-of-a-kind accommodations and outdoor adventures round out the entertainment at Unicoi State Park & Lodge. Few things are better than an overnight stay at a mountain getaway in the fall. And few people have the opportunity to spend the night anywhere in a barrel-shaped cabin – unless, of course, they visit Unicoi State Park & Lodge in the northeast corner of Georgia near Helen. Designed as an experiment by the University of Georgia and built in the early 1970s, the barrel cabins are positioned around Unicoi Lake. “The cabins are on stilts and are designed to be able to be picked up from the area if it is deemed to be overused, and be deposited in another location,” says Alex Raymond, a spokeswoman for the park. Three one-bedroom cabins truly are barrel-shaped. The park has 12 additional two-bedroom cabins that are A-framed with rounded sides. All of the barrel cabins are two stories, and they include a living room, dining room and kitchen downstairs. The bedroom or bedrooms are upstairs. The interiors are predominantly wood, and metal roofs curve over the sides to the base of the cabins. Windows are located on each end of the buildings. The barrel cabins also have decks that look out onto the lake. Cooking and eating utensils, along with linens, are provided. 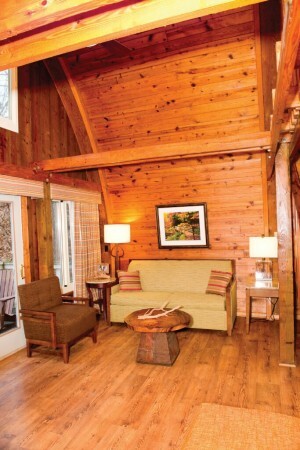 The cabins are equipped with central heat and air, but they also have wood-burning fireplaces in the living room area. And for those who don’t want to retreat from the outside world completely, the cabins have cable TV in the living rooms. 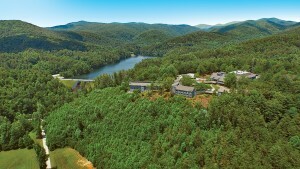 They also offer easy access to hiking and biking trails as well as the beach at Unicoi Lake. Other accommodations include a 100-room lodge, more cabins and 82 campsites. Ten secluded, two-bedroom, two-bath Smith Creek cabins are an ideal escape for nature lovers. These one-level cabins also feature a full kitchen, central heating and air, a wood-burning fireplace and easy access to downtown Alpine Helen, trout streams and Anna Ruby Falls. Visitors who prefer to linger on the premises when they get out of bed can enjoy quiet mornings watching deer and wild turkeys. Large groups of people can reserve a three-bedroom, two-bath deluxe cabin with two king bedrooms, one queen bedroom, a sleeper sofa, full kitchen, cable TV and fireplace. These four barrel-shaped, two-story cabins have a bath on each floor. As inviting as the accommodations are, the 1,050-acre park offers a multitude of outdoor adventures as well. The park includes 14 miles of hiking trails within its boundaries, and many more trails are available in the area. Unicoi Lake and its beach are swimming with water activities such as standup paddle board, pedal boat, canoe and kayak rentals during the season. The park also offers two phases of zip lines, including one that travels along the lakeshore for 2,000 feet. Guests can go on guided hikes and enjoy fire pit stories and s’mores. Competitive visitors can vie against each other or against themselves in the new Archery and Air Rifle complex. For meal time, the Main Lodge features two restaurants. The Unicoi Restaurant is known for its mountain trout, and the newly remodeled Smith Creek Tavern features live music Friday nights. 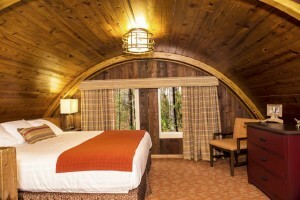 Unicoi State Park & Lodge is not just a great place to spend a weekend getaway, however. The park also has facilities for any type of group from corporate retreats to family reunions to weddings. “We do all of our own catering and are happy to work with groups to create an event that is customized to their wants and needs,” Raymond says. Other special events attract visitors to the park as well. For instance, September 29 is Outdoor Adventure Day, which introduces guests to activities such as fishing, archery, shooting and more. The Georgia Department of Natural Resources assists with the program. In nearby Helen, where a shuttle from the lodge runs daily, the 48th annual Oktoberfest begins in early September. Visitors can sleep at the park at night and by day enjoy German music, food, drinks and dancing including waltzes, polkas and the chicken dance. Oktoberfest will run September 6-9, 13-16 and 20-23. The festival then reopens September 27 and continues daily through October 28. Published on September 4, 2018 in Georgia, Travel.